The 5.11 Tactical 3-in-1 jacket is uniquely engineered with dual layer resistance to moisture penetration while allowing moisture vapor inside the jacket to pass through the 100% nylon face for maximum breathability. 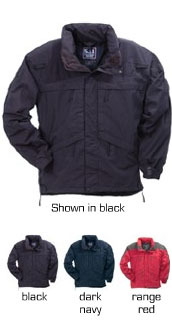 In short, this jacket works twice as hard to keep you dry. Combine its waterproof/breathable abilities with a fully taped seam construction and you have a tactical performance jacket that, like you, always gets the job done. Imported.